Hsiao-ting Lin’s highly informative and useful account of the creation of the modern Taiwanese polity in Accidental State provides the first comprehensive, English rendering of the events and political processes which ended in the establishment of Taiwan as an independently governed state. 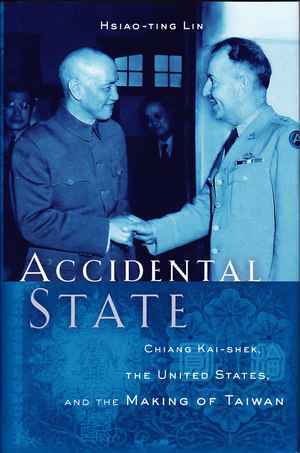 The title of the book indicates its main themes: that this process was completely dependent on a variety of events and conditions which could not have been foreseen in their appearance or impact, and the important roles that Chiang Kai-shek and the US played in this process. As such, its discussions of events and political conditions place it squarely in the intersections of literatures on the Chinese Civil War and its aftermath, Chiang Kai-shek and the KMT, American Cold War strategy, the impact of the Korean War, US-Taiwan relations, and Taiwan’s history. Working with a wealth of archival material from both Taiwan and the US, Lin meticulously documents the political decisions, reactions to shifting circumstances and unforeseen events, policy debates, political rivalries, and strategic calculations which informed the crucial years from 1945 to 1951. These cover the emergence of China from the Second World War through the rekindling of the civil war between the KMT and the CCP, to the CCP’s triumph and Chiang Kai-shek’s takeover of Taiwan as a stronghold of KMT power, and to the outbreak of the Korean War. All these events point to a series of accidental developments within the KMT, China, and the US government which led, against the odds, to a Taiwan that was not engulfed by the mainland, but also not independent of outside claims or influences. An important theme of the book is the deeply ambivalent views US policymakers held towards Chiang Kai-shek in the aftermath of World War II. Lin demonstrates that while some policymakers accepted that Chiang was the most powerful KMT leader, others in the Truman administration deeply doubted his abilities to hold together the KMT and China. They also distrusted his intentions and were wary of his successful attempts to manipulate political rifts in the US to his advantage. Lin shows that decreasing faith in Chiang’s abilities on the part of important figures in the administration led not only to reductions in aid and attempts to find KMT alternatives to him on the mainland, but also to attempts to displace him on Taiwan, and eventually to the decision to abandon him and Taiwan once the civil war was lost and the prospects for American or UN control of Taiwan were rendered moot by events. Paradoxically, Chiang’s unforeseen success in holding the island for the Nationalists and his KMT bloc in the face of American, CCP, and KMT factional opposition both endangered Taiwan’s existence as an independent entity, and eventually led to its current self-governing status. Initially, the Truman administration responded to his success on Taiwan by deciding that if the US could not physically control Taiwan or run it without going through Chiang’s KMT, it would abandon the island to the CCP. But facing a resurgent revisionist threat in Asia, the administration recognized that the US needed Taiwan as a base to contain Asian communism, and decided it could work with and protect a Taiwan which the US could not physically control. This discussion highlights another aspect of Taiwan’s accidental status as a self-governing entity which Lin usefully emphasizes: that this outcome of post-World War II events was not at all what the primary actors wanted. The Nationalists wanted Taiwan to be an integral part of a KMT-controlled greater China. The Communists wanted it to be an integral part of a CCP-controlled greater China. The US envisioned it as a US or UN-controlled protectorate free of Chiang’s power and influence. And though they were at the time not major actors, proponents of Taiwanese independence wished for a state (free of Chiang and the KMT) whose sovereignty would be recognized by the international community and accepted by whomever governed China. Instead, the very contingency of events and conditions in which these players were immersed led to the creation of a KMT and Chiang-dominated “bastion” dependent on the US for its existence and international influence, and claimed by both the Nationalists and the Communists as part of China. Conceptualizing Taiwan as an accidental American dependency may lead us to rethink some parts of the history of America-Taiwan relations and accounts of Taiwan’s position in the world. It is true that early on, Taiwan’s status as an American dependency allowed it to punch above its weight in world affairs (particularly through its possession of the China seat on the UN Security Council). But Lin’s account should lead us to emphasize even more strongly that American support for Taiwan was not founded on any strong appreciation of Taiwan’s intrinsic value, and in turn should lead us to discount the influence of the China Lobby in the US, which attempted to paint Chiang’s Taiwan as a free, democratic state which the US should support as a full ally. As an inadvertent American dependency which owed its continued existence almost solely to its strategic geographical position and fortuitous developments in the early Cold War, Taiwan could not but be at the mercy of the twists and turns of American foreign policy and the ambivalence of successive American administrations towards Chiang as the US maneuvered through Cold War contexts. Taiwan’s global decline in the latter part of the Cold War should be explained in part by its accidental and contingent origins. Yet this account also helps place Taiwan’s subsequent history in clearer contexts. An accidental status that created a severely limited Taiwan should have resulted in a short-lived Taiwanese polity once the US ceased to highly value it strategically. While domestic efforts in the US in the late 1970s (resulting in the passage of Taiwan Relations Act) have played an important role in extending limited American protection to Taiwan despite American rapprochement with the PRC, it has been developments on Taiwan which have continued to make it relevant in the face of an increasingly powerful and assertive PRC. In transforming itself from an economically underdeveloped authoritarian state to a highly developed liberal democracy, it has largely overcome its questionable origins domestically and staked out a place in the global community of liberal democratic states. As Lin notes, only the Taiwanese themselves considered Taiwan in the late 1940’s as anything but a former Japanese colony of negligible worth. It was too Japanese for Chinese tastes, and the KMT viewed it merely as a base for retaking the mainland. For the Americans, it was too backward to be anything but a stationary aircraft carrier. Taiwan’s dependent status, be it on China, the US, or the UN, was considered fitting. But its current situation, even given its limited international recognition, vindicates the faith of its Taiwanese proponents in its potential and future. Lin’s account allows us to fully appreciate this outcome; his book should be included in all subsequent attempts to understand Taiwan’s history and development. David J. Lorenzo: Rezension zu: Hsiao-ting, Lin (Hrsg. ): Accidental State. Chiang Kai-shek, the United States, and the Making of Taiwan. Harvard 2016 , in: Connections. A Journal for Historians and Area Specialists, 03.11.2018, <www.connections.clio-online.net/publicationreview/id/rezbuecher-28809>.